This weekend two members of Ethryll (Kris and I) escaped to Dublin for a much needed break. 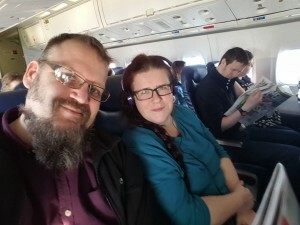 We were also celebrating our 11th wedding anniversary. We had a fantastic time and it has been an inspirational weekend, musically speaking. It was good to be somewhere where the live music scene is truly thriving. Firstly we hit Dublin’s amazing selection of music shops. The Gandharva Loka world music instrument shop gave me the chance to purchase the much longed for rain stick to add a sea sound to the start of Eel Reel. I also got some bells which I am sure I will work in somewhere. My silly purchase was a tiny working harmonica necklace. This shop is a little gold mine for percussionists and what I want to call “World Woodwind” players. A very friendly place. 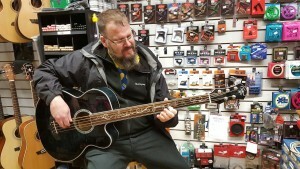 At M usic Minds Kris hit gold in his search for a stage worthy acoustic bass. He found a Michael Kelly 5 String Dragonfly Acoustic Bass. It not only sounds amazing, and perfect for Ethryll, but it is a visual work of art too. We couldn’t bring it back on the plane, so they are shipping it to us this coming week. I am very excited for it to get here and start hearing it in the band. The new bass is called “Mammy” (Sunday name “Agnes”) because it is from Dublin, and it has a Dragonfly on it*. I also picked up a better strap for my Djembe (an old handbag strap will not do long term) and a “Travelog” stomp pedal so we can have a stronger beat behind some of our songs. 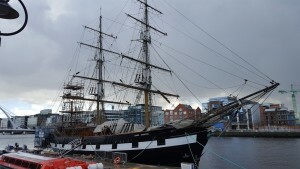 replica Tall Ship “Jeanie Johnston”. The original ship has an amazing story which I am hoping to tell at least some of in some new songs now officially “in development”. If you want to whet your appetite by finding out more you can take a look at http://www.jeaniejohnston.ie/ Jeanie Johnston’s story will provide a great contrast to “Fastnet”. 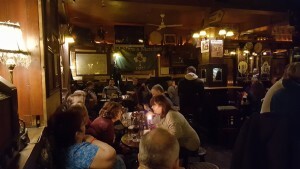 In O’Shea’s Merchant’s we found some great music. I was impressed with the Sunday session. The occasional trad. song to sing along to, but it was enlivened by some brave covers which the lads really pulled off. Folk Bob Marley works. The pub also does a great Seafood Chowder and Veggie Curry. 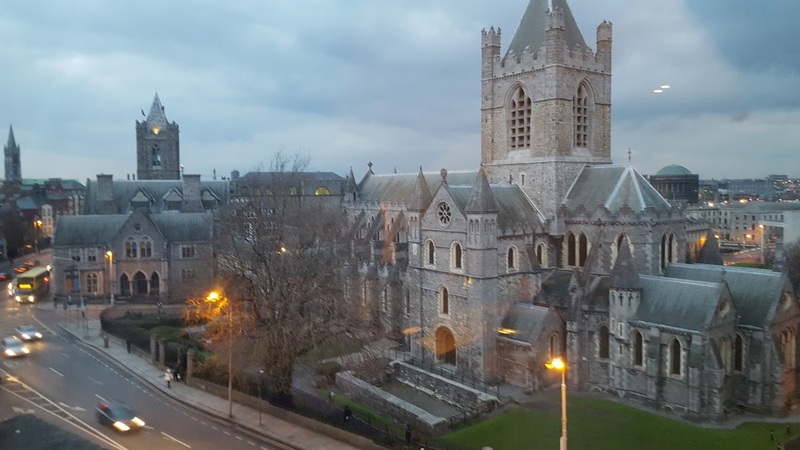 Thank you for an excellent trip, Dublin. Thank you too to Jury’s Inn Christchurch for a lovely stay. * The Mammy, Agnes Brown, is the central, rather sweary character in the RTE/BBC TV series Mrs Brown’s Boys. **But mind your head on the Flying V hanging from the ceiling. It’s even pointier than it looks. Previous PostPrevious Download our band photo!